Volkswagen has been synonymous with creating drivers’ cars for decades; cars that communicate the road; cars that offer excellent steering feel; cars that make driving fun. The company got its reputation for this when it came out with the GTI hatchback—a hopped-up version of the Rabbit—in the early 1980s. The GTI is, of course, still one of the foremost hot hatchbacks on the market today. However, what if you want the fun of a GTI but in a sedan variant? 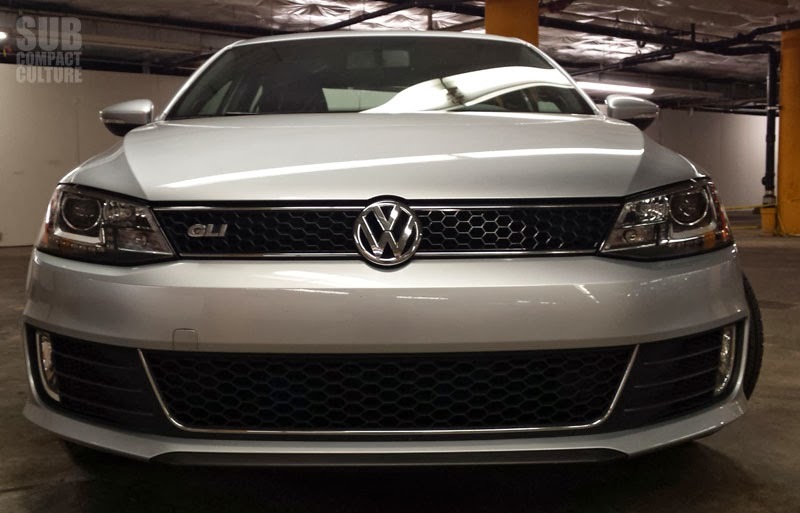 You look to the VW Jetta GLI. The latest GLI offers a host of goods that turn the regular Jetta into a sporting sedan. Like all Jettas for 2014, it has a fully independent suspension. However, the GLI gets a sportier tuning that regular Jettas. You get VW’s wonderful 2.0-liter TSI turbocharged four cylinder, which makes 210 horsepower and 207 lbs/ft of torque. There are GLI-specific front and rear fasciae, which have a more aggressive look than standard Jetta models. 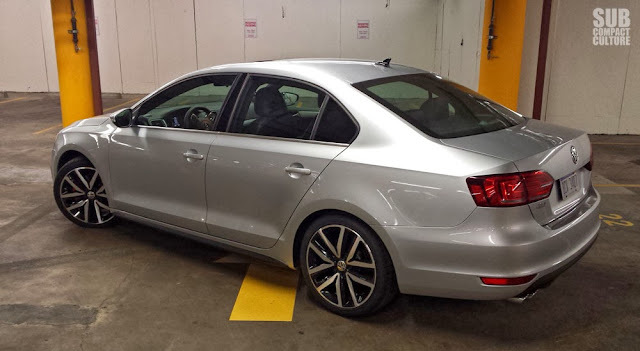 Our test model has the Autobahn package which also includes 18” wheels and tires; smoked LED taillights, V-tex leatherette seating with red stitching; a Fender premium audio system; xenon headlamps; and other bits that make this Jetta the one to get if you’re looking for fun and four doors. The latest Jetta has been panned by critics, but I happen to find the GLI very attractive. While base-model Jettas may appear bland, the GLI Autobahn adds enough finesse to take it from bland to sophisticated minimalist, especially in Reflex Silver Metallic, which could be the perfect color for this sedan. 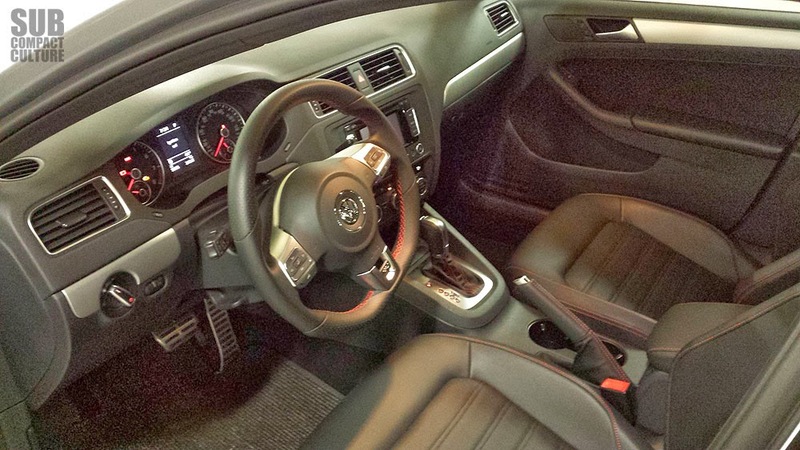 Slip inside the Jetta and there’s a sophisticated, upscale theme. Most of the materials feel of high quality, and there’s a host of black and silver trim bits. The red stitching on the upholstery adds a sporting touch. The driving position feels just right—not too laid down and not too upright—and the steering wheel feels great in the hand. 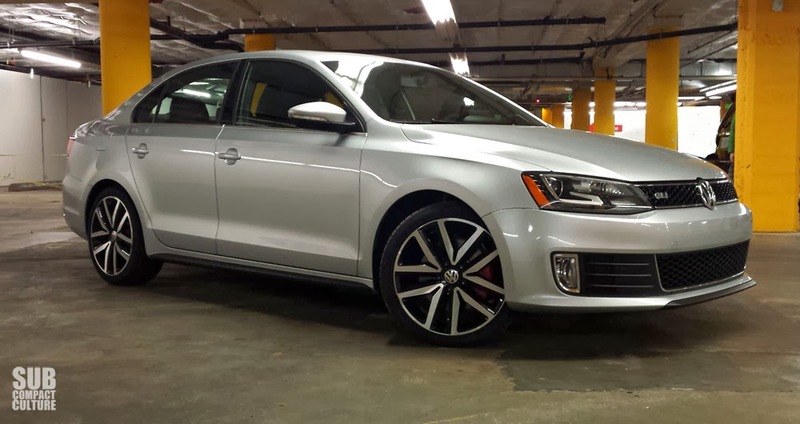 The GLI feels the way you’d expect a sports sedan to feel on the inside. I do wish there was a bit more side bolstering to the seats. Speaking of those front seats, they are heated with multiple settings from low to egg-frying hot. Honestly, these are some of the best (and warmest) seat heaters I’ve expericned. The back seat offers plenty of room for adults, and the rear seat folds down if you needed to put more cargo into the vehicle. And by the way, the trunk on this thing is enormous, especially considering the vehicle’s size. On the down side, there were more rattles than we would’ve liked on the interior. Plus, I never got used to the start/stop button location, which is on the upper-left part of the center console. I kept going for the steering column, then the dash, and finally to the correct location. By the way, the Fender sound system is fantastic. I’d experienced it in the latest Beetle, and it sounds just as good in the Jetta. VW’s touch-screen infotainment center is easy to use, and has a lot of menus to scroll through. This GLI was equipped with VW’s DSG (Direct Shift Gearbox) dual-clutch automatic. One of the better ones on the market, the shifts are extremely fast and the transmission responds quickly to manual taps on the steering wheel paddles or by moving the gear selector. There is a bit of hesitation when starting from a standstill. It takes a bit of getting used to, but it does work very well. Acceleration is strong and there’s plenty of power to be had. And while other sporty compacts, such as the Ford Focus ST and the 2013 MAZDASPEED3 offer more power, the Jetta is no slouch, even at 3,158 lbs. This Jetta also sounds great under wide-open throttle. There’s a seductive growl when accelerating, which only adds to the driving experience. It may not be as fast as the Focus ST, but it feels very refined and European in both power delivery, handling, and ride. When the corners come up, the Jetta doesn’t disappoint. Cornering is responsive and precise and is helped along by the electronic limited-slip system called XDS which, like many new vehicles, employs the brakes to instead of a mechanical LSD. I did note the traction control was on the sensitive side and would occasionally come on when you didn’t want it to. There is a button to disable the traction control, but I left it on most of the time. The GLI's steering is fantastic, by the way. It's weighted ideally and the steering ratio feels quick. For 99% of the driving I did, the car handled very well. It also has a supple highway ride. As cliché as it is to bring up German cars and the Autobahn, this is the Autobahn model afterall, and yes, I’m sure it’d ride quite well at higher speeds. Equipped with four-wheel disc brakes, our GLI also have excellent brake feel, and it was easily modulated. VW proves yet again it can build a driver’s car with the new Jetta. Rated at 24 city, 27 combined, and 32 highway, I got 29 MPG all day long; impressive since the vast majority of the driving I did was in the city. The GLI does drink premium fuel. Sophisticated, stylish, comfortable, and powerful, Volkswagen has taken its latest Jetta and turned it into a very good compact sports sedan, much like it has done for decades. While it isn’t perfect, it’s one of my favorite VWs that I’ve driven in some time. You often pay a premium for these great driving dynamics and well-appointed interiors, and the '14 GLI Autobahn is no exception. Our test model came to $30,415. Granted, that's loaded (and includes navigation and a moonroof). If you are looking for performance, the Focus ST is faster and a bout $900 less expensive. But if you're set on a sedan, the ST is out of the question. In fact, if you want a performance-oriented compact sedan other than the GLI, you've got the Honda Civic Si, which is close to the same power, but not as well appointed inside; and the Acura ILX, which is very similar to the Si, but not as sporting, although it has a posh interior. There is also the Subaru WRX sedan, which doesn't have nearly as nice of an interior and doesn't feel nearly as polished, but it has quite a bit more power (265 hp) and has all-wheel drive. Only the ILX offers an automatic transmission, though. The GLI isn't about being the fastest. It has impressive driving dynamics, a competent amount of usable power, and minimalist good looks. It's an appealing overall package; certainly one of the best VWs I've driven in a while. So if the compact sports sedan is your thing and you're not down with hatchbacks, the Jetta GLI has a lot you'll probably like. And like many other sports-oriented VWs of yore, this GLI is certainly a driver's car. Even if the driving dynamics are great I just can't get over the looks. The car is just boring outside and cheap looking inside. It would have to just rock my socks in order to even get on the consideration list.